When things go wrong, we sometimes apologize or blame ourselves; sometimes we blame other people. In the following, you can practise phrases used to apologize and to lay blame. Beware of false friends: “Don’t blame me!” does not mean “Blamier mich nicht!”. Jemanden blamieren means “to embarrass somebody” in English. Diese Übung stammt aus dem Übungsheft Spotlight Plus 11/2018. Die ganze Ausgabe können Sie in unserem Shop bestellen. 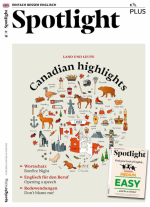 In Verbindung mit dem Spotlight-Magazin gibt es das Übungsheft auch günstig und bequem im Abo.